Philly's housing market cooled at 2016's end. A blip or a trend in the making? Throughout most of last year, it seemed as if Philadelphia's median home-sale price could move in one direction only: up. After three consecutive quarters of consistent — and record-breaking — growth in 2016, however, Philadelphia's housing market finally cooled off a bit in the fourth quarter. For the first time in a year, the median sale price for single-family homes -- that is, excluding condo sales -- within the city limits declined in the October-through-December period, dropping 6 percent to $140,000, from $149,000 in third-quarter 2016. The median is the middle value; half the homes sold for more, half sold for less. Still, Philadelphia's median home-sale price finished 2016 higher than it was the year before, growing 8.6 percent year-over-year from fourth-quarter 2015. That fourth-quarter price dip is not one to be alarmed about because it highlights a change in consumer demand, rather than a slowdown in the market, said economist Kevin Gillen, senior research fellow at Drexel University's Lindy Institute for Urban Innovation, who released on Monday his analysis of sales data from the city's Recorder of Deeds Office and Trend Multiple Listing Service. The housing industry typically cools in winter months, Gillen said, when cold weather and the holidays distract buyers from purchasing. To better evaluate what is happening in the city's real estate market today, Gillen uses an index that measures home values over time and thus assesses what Philadelphia's total housing stock is worth, rather than relying on a limited number of properties sold during a particular period of time. That way, he said, he can evaluate how the market is changing based on market forces alone — stripping out such factors as the season or the physical characteristics of an individual home that sold. Those factors, he said, can be volatile, and skew what is happening in the market. "Median prices bounce around because of seasonality," Gillen said. Meanwhile, the index can show that "buyers desire to be in Philadelphia, or not be in Philadelphia." 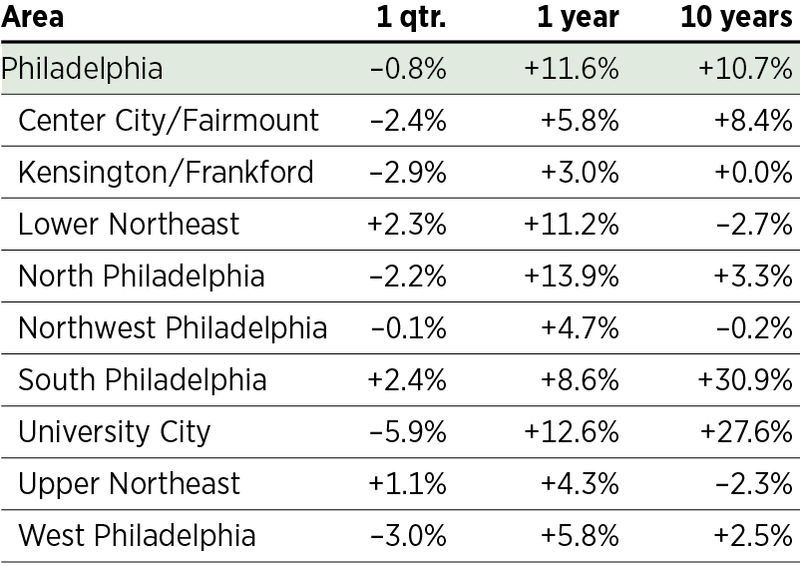 Home prices in Philadelphia have been trending higher since 2012, with 10 consecutive quarters of growth that ended with a small dip in the fourth quarter of 2016. Shown below are indexed median prices since 1980 for the city’s housing stock, adjusted to account for different housing types and to eliminate seasonal variability. "The resulting index is ... analogous to a Dow Jones index for house values: Its level may not mean much, but its percent change over time reflects the change in the average house value over time." Using that method, Gillen found that property values in the city dropped just 0.8 percent in the fourth quarter compared with the previous quarter. And despite that quarterly decline, he found that Philadelphia home values were actually up year-over-year, jumping 11.6 percent. Home values in Philadelphia grew by 11.6 percent since 2015, but fell slightly in the last three months of the year, according to an analysis by Kevin Gillen of Drexel University. His index tracks the value of an area’s entire housing stock, instead of only the prices of homes that were sold. "Historically, the average annual appreciation rate of a typical Philly home is in the 3 to 5 percent range, so this was an exceptional year," Gillen said of 2016. "The best year since the recession." For the city, the double-digit jump in home appreciation in the last year underscores just how complex changes in the real estate market can be. On one hand, the significant growth in value indicates the increasing attractiveness of Philadelphia as a place to work and live, Gillen said. But at the same time, that same rapid growth also introduces concerns of affordability in the poorest big city in America. "This is falling especially hard on young, first-time home buyers. ... The spread between city house prices and city incomes is currently close to an all-time high," he said. Despite such a hefty annual increase in home value, Gillen said the small quarterly decrease in median sale price should not be ignored. Combined with a dramatic decline in the number of home sales — only 3,835 homes changed hands from independent owner to independent owner (so-called arm's length transactions) in the fourth quarter, a 28 percent plunge from the previous quarter — the pause in price appreciation reflected by his index could indicate that buyers have begun to say no, Gillen said. "Buyers are either beginning to balk at some of the high list prices they are seeing, or are having trouble finding the home they want, given the low supply, or some combination of the two," he said. Nationwide and here in Philadelphia, the number of homes for sale has remained at very low levels, driven in part by a dearth of new-home construction and by a recovering economy that has sent more prospective buyers flooding into the market. At the current pace of sales in the city, Gillen found, it would take only 3.3 months to sell all the homes currently listed — a rate that ranks as the lowest since the pre-bubble years of the early 2000s. Nationally, December 2016 closed with just a 3.6-month supply, according to the National Association of Realtors. Industry experts consider a six-month supply normal. Low inventory coupled with a drop-off in buyer activity is something that broker Chris Somers, owner of Re/Max Access in Northern Liberties, noticed in the fourth quarter. "We certainly saw showing activity go down in October, November and December," Somers said. "I would attribute that to a few things: There was so much activity in the first half of 2016 — the market was absolutely insane. … Because there was so much, buyers may have pushed up their buying time line, meaning there was a pause in the fourth quarter." "With home prices going up so fast, so quickly — it's difficult to maintain," he said. "It's not surprising that there was a bit of a pause or a pullback." For now, Gillen said, it remains too early to tell whether the small decline is here to stay. "Going forward," Gillen wrote in his report, "the moderate conditions will likely continue through the remainder of the winter months." Spring's numbers, meanwhile "should indicate whether the current cooldown is part of a temporary seasonal pattern — or is indeed part of a longer-term shift toward a more balanced market."